ELVIS Face on Tortilla! FAKE! 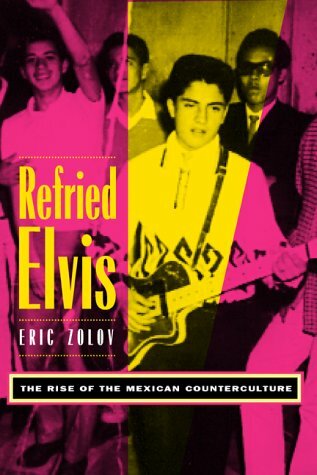 Refried Elvis, published by University of California Press. Author Eric Zolov is coming to Kutztown to give the 2012 Esther Willits Lecture on April 3. Dr. Zolov is a Professor of Latin American History at SUNY, Stony Brook. 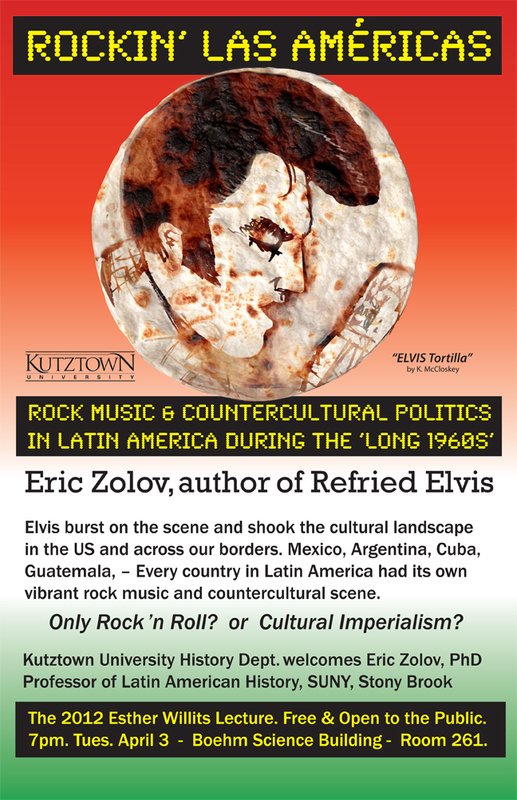 He may be the foremost academic expert on what Mexicans call “La Onda” (The Wave) the music-driven counterculture that swept through Mexico and Latin America beginning with Elvis. 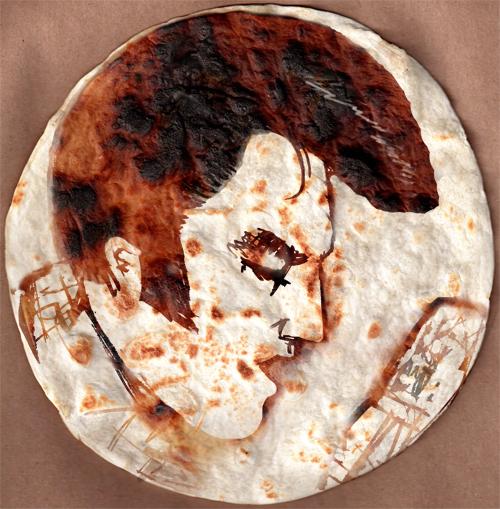 That’s why I went to the trouble of creating the Elvis Tortilla. 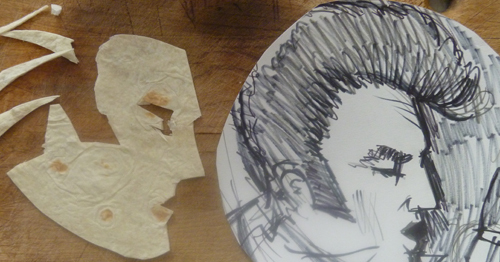 My first try involved sketching Elvis at 8 inch tortilla scale. I placed a profile cut from one tortilla on a second and tossed them in the pan. I went with wheat tortillas, corn might have worked better. When I tried to remove the profile, the base tortilla came apart. That’s when I resorted to Photoshop. 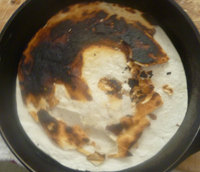 I burned a tortilla until it was as black as Elvis’s hair. I put that on the scanner along with a lighter tortilla. Then I fashioned a mask based on my original sketch. I had trouble masking, but I sat in the student lab alongside Photoshop pros, Jerry Cavill and Mike Mangigian, who helped me out. Below is the final poster with the Photoshopped tortilla. Dr. Zolov’s lecture should be fascinating; I hope he brings some records. Tuesday, April 3, 261 Beohm, 7pm. Kutztown University. Hasta Pronto! Rebeldes con causa etc sounds like a decent book for those who want to improve their Spanish. Will check it out. Did anybody eat the tortilla? Howard, Thanks for your comment. Hate to waste food, but nobody ate the tortilla. I got the book in English. It is a serious read. For example, Zolov suggests that after the 1968 massacre of students at Tlateloco in Mexico City, stunned students channeled their rebellion into music. It’s available on Amazon UK but only in English. I quite like serious books that refer to Elvis so I have ordered a copy. Race Rock and Elvis is another. It is really about race relations in the South. Recommended. Pity about the tortilla. If you haven’t heard Bruce Springsteen’s recent speech in its entirety, you will like the stuff he says about Elvis about 10 minutes in. Have had a listen to the speech and understand what he says about timing. TV was important to Elvis because it created a community around him almost immediately. We also had the excitement of a person being galvanised by technology which is why relating the myth of Frankenstein to Elvis appeals to me. Turned out good. I kind of want a Jesus toaster.